The Maxprep™ Liquid Handler provides automation for sample preparation of the Maxwell® RSC cartridges and trays as well as post extraction sample preparation for fluorescent quantitation, sample normalization and a variety of PCR reaction set ups. The Maxwell® RSC 48 Instrument works with convenient, individual pre-filled cartridges to process any number of samples from 1 to 48 without the risk of wasting reagents. 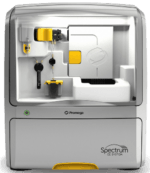 Promega this week introduced its new modular nucleic acid preparation system that allows labs of all sizes to adapt to changing workflows. 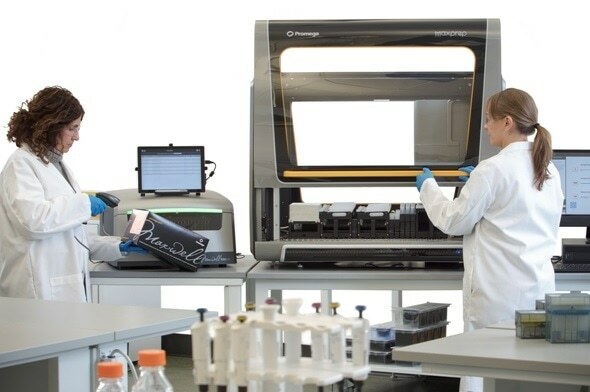 The configurable system works with existing Promega Maxwell® RSC instruments with a software upgrade and introduces two new components: the Maxwell® RSC 48 for hands-free nucleic acid extraction and the Maxprep™ Liquid Handler. New Promega Portal Software allows the new and existing Maxwell® RSC and Maxprep™ instruments to work together to transfer sample tracking information from one device to the next to build a complete nucleic acid preparation workflow. Data can also be imported into a laboratory information management system (LIMS). Flexibility and scalability that matches laboratories’ changing throughput requirements and budgetary constraints, allowing them to start with a modular workflow to address current sample processing needs and grow the system as needed. Functional redundancy that ensures laboratory workflow is never disrupted. Efficiency that makes smart use of lab space with compact modules that can be positioned where space permits. The Maxwell® RSC 48 and Maxprep™ Liquid Handler are supplied with preprogrammed methods that allow for the system to be utilized by anyone in the lab regardless of prior instrumentation experience. The system, components, chemistries, and application build on Maxwell technology developed by Promega over the last 10 years and are backed by the company’s commitment to service and support.